A couple years ago I ordered a pair of denim that ended up being in my top 5 pairs of favorite jeans. They had slight distressing, were high waisted and the hem was destructed in the perfect way to show off my fall booties. Today I’m neither tucking my jeans into my boots or cuffing them and the destructed hem is they way I like to go. Therefore, I decided to do some DIY destructing on my older jeans. The first pair I worked on were my maternity jeans because I wasn’t sure how it would turn out and I didn’t want to mess up my better denim. I loved it so much and had so many questions I decided to destruct the hem on another pair of jeans. This time I chose a pair of basic skinny jeans. 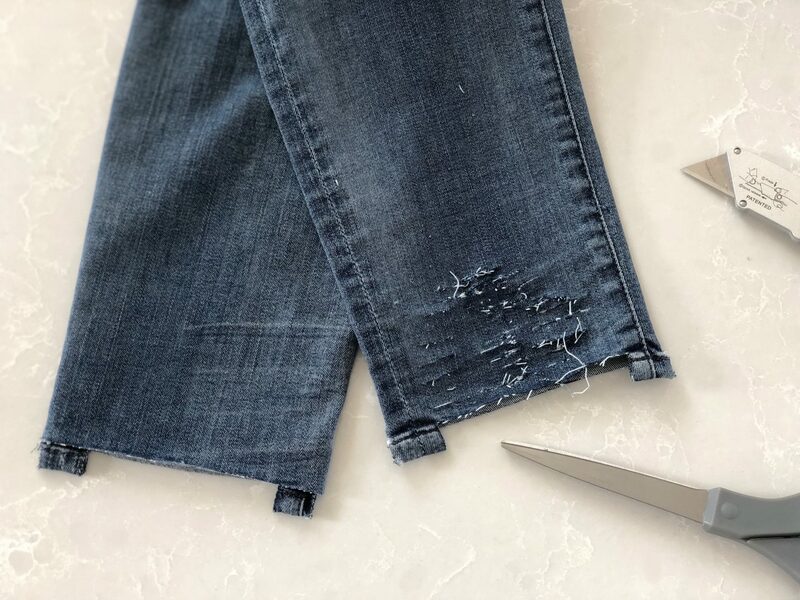 Start by cutting the hem off the jeans. Cut just above the stitch line. Keep in mind the side seam of your jeans is going to be the bottom so cut where you want that to hit on your ankle. I let my side seams as is and cut just the front and back. 2-3 inches above your hem make your first cut with the razor or you can take your ruler and measure exactly and mark it with the pen. 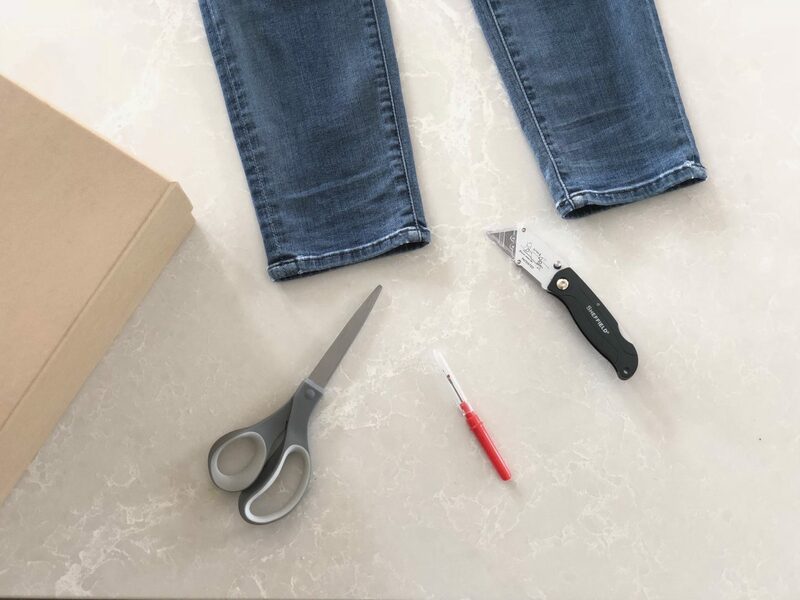 Put your jeans on the cardboard before you make any cuts to prevent your counters from getting scratched. Do that on the front and back of each pant leg. I eyeballed it because it doesn’t have to be perfect. You can sketch the area you want to be cut and fringed before starting. I also eyeballed this since it doesn’t have to be perfect. 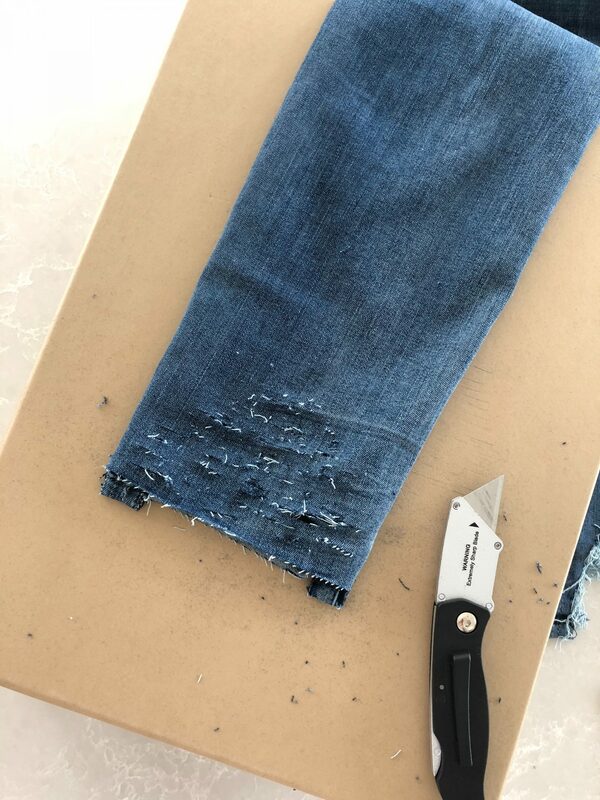 Use your razor blade to start putting slices in the jeans, start at the bottom and make your way to the first mark you made. Don’t forget to make sure your jeans are on the cardboard. 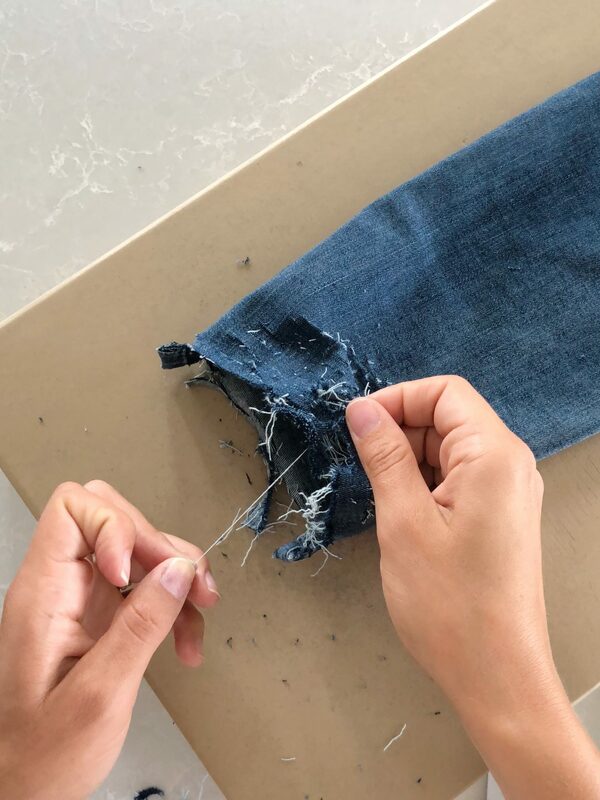 Make sure your slices are straight across, if you go at an angle you will cut the white threading of your jeans and you wont have as much fringe. You will lose some and that is ok.
After sliceing the front and the back of your jeans start ripping the slices. This will help start the fraying process. Open up all the holes as much as possible. Next you can use your fingers or tweezers to start pulling the white strings across, some will be lost and some will be cut and end up on one side. 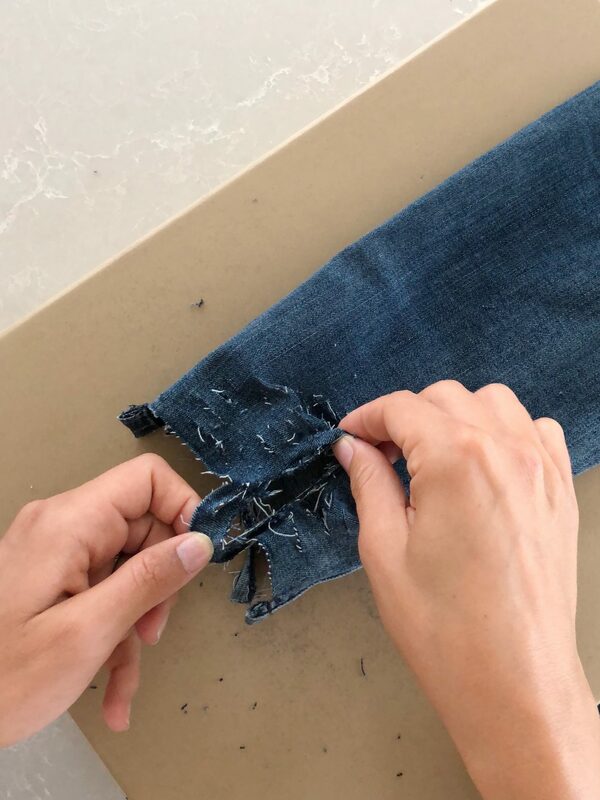 You may need to use your seam ripper to start the removing process but you should have quite a few loose threads from the step before when you opened the holes. For the white pieces of thread that have not been cut you can cut or rip them anywhere but do that at the end to save time. Once enough pieces of white thread are removed you can pick off chunks of the blue threading and discard. Once you are finished toss your jeans into the wash to straighten out the white fringe! Wow!! I have the perfect pair of jeans to try this on!! Thank you for sharing!! !